I thought I'd blog about what's going on in my studio at the moment. Due to a bereavement and ill health, it's been over a year since I was up there (it's in my attic, by the way) and after a good tidy up a few weeks ago, I'm back creating. 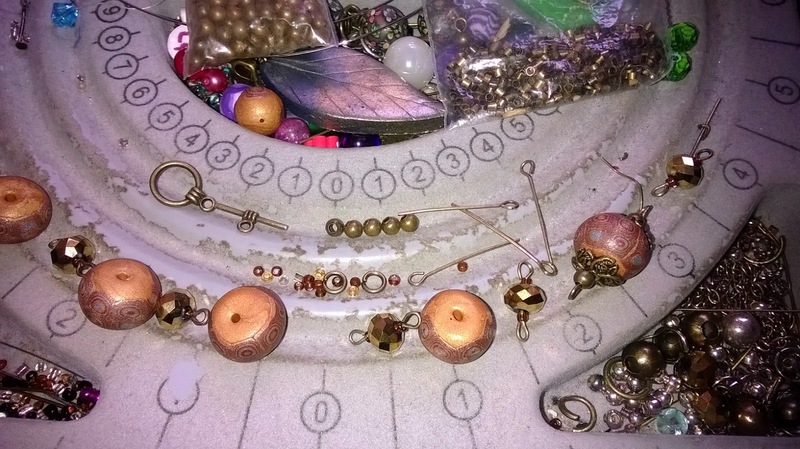 I've not made any new beads yet, but I had quite a considerable stash which I'm working my way through and in doing so I'm starting to get ideas for new beads, pendants and brooches. I'm having a real love affair with bronze and brass components. I love them. They give a real vintage feel to my jewellery and compliment my beads really well. 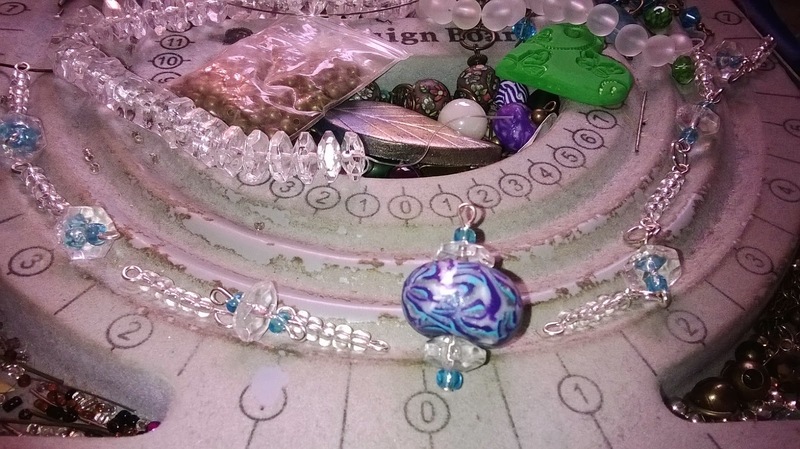 (Although some beads do look better with silver findings!) I've gone back to my roots a bit too and have been stringing my beads with seed bead necklaces. Rather than finding it monotonous and time consuming, I've really found the counting of tiny beads between the larger space beads to be very therapeutic. A little bit how knitting and crochet relaxes me and gives me time to think and meditate. I also like using eyepins and a variety of spacer beads with my own beads to make little elements that I join together with jump rings. Always leave something unfinished on your work bench. I find that when I return and finishing it off, by the time it's done my mind is back in creative work mode and I am thinking and raring to go on my next project. It works everytime! 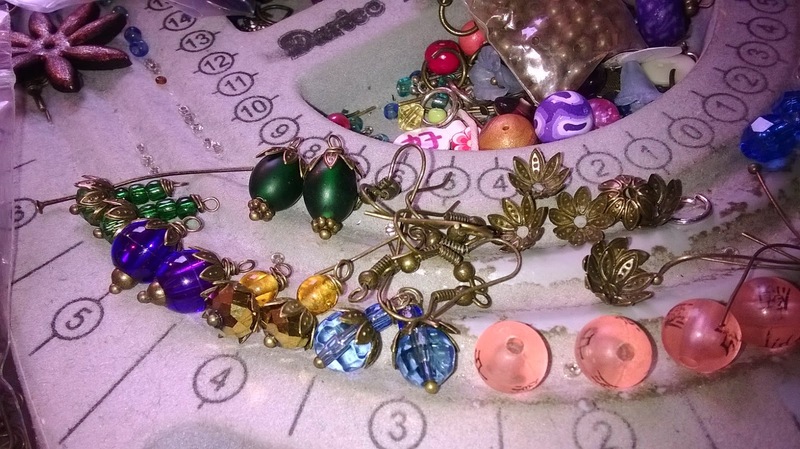 Consquently, my work bench is a bit of a clutter because I usually think up and prepare quite a few new projects while I'm finishing the one off...especially when I'm making earrings. 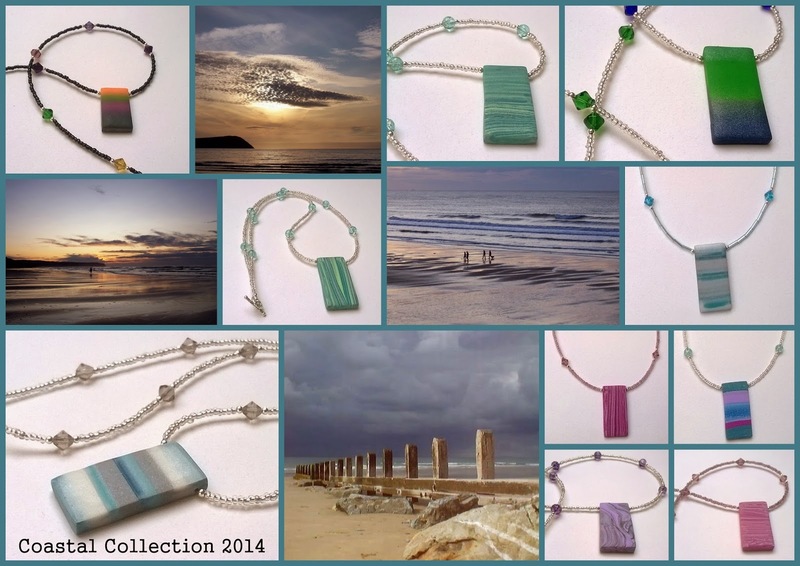 Introducing my Coastal Collection. Inspired by summer trips to the coast while on holiday with my family. Memories of walking along the headland full of flowers and bracken, Walking along the beach collecting pebbles, Watching the sea from sunrise to sunset and eating ice cream and candy floss from the carnival stands. Happy days! The pendants are made from polymer clay and have a slight shimmer to them. They are hung from necklaces comprised from seed beads, silver spacer beads and crystals. They fasten with a small toggle closure, making it easier to fasten on and off. No more struggling with tiny clasps. I've just listed lots of new jewellery pieces in my Etsy Shop! Who doesn't love butterflies in their garden? 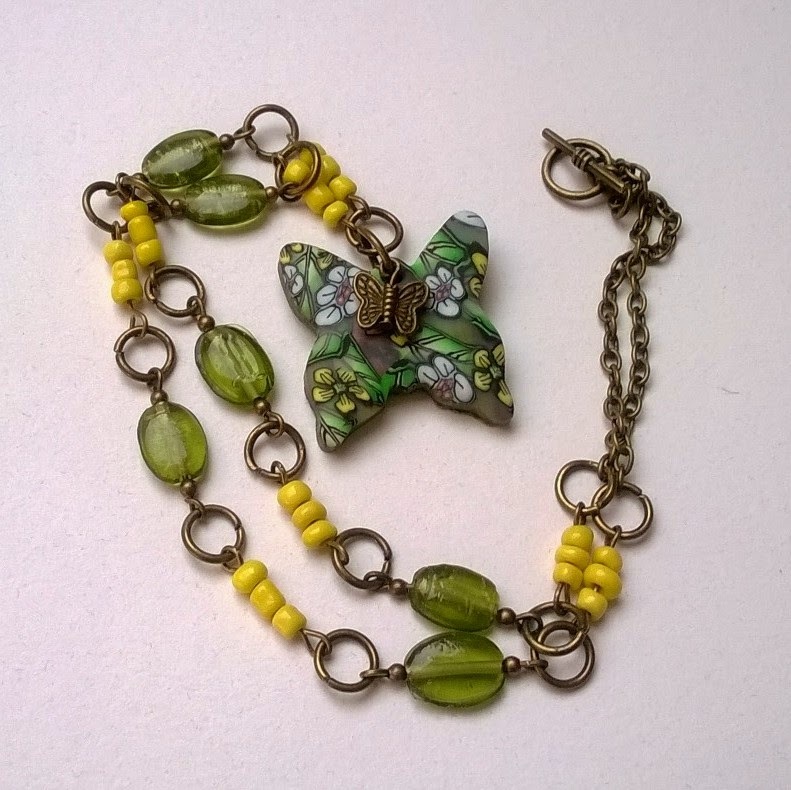 This Garden Butterfly polymer clay pendant is a mixture of both as it is abundant with flowers and leaves in yellow, white and green. 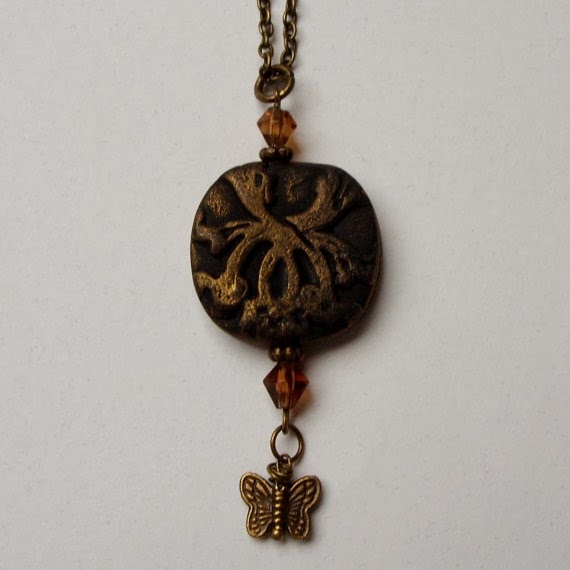 There is a small bronze butterfly charm attached to it. The pendant is attached to a necklace comprised of yellow glass seed beads, gorgeous green glass oval beads, bronze spacer beads, jump rings and chain. The necklace fastens with a small toggle closure, making it easier to fasten on and off. No more struggling with tiny clasps. Chain measures approx 19 1/2"
Pendant drop measures 1 1/2"
Butterfly pendant measures 1 1/4" x 1 1/4". I love daisies! Don't you love daisies? 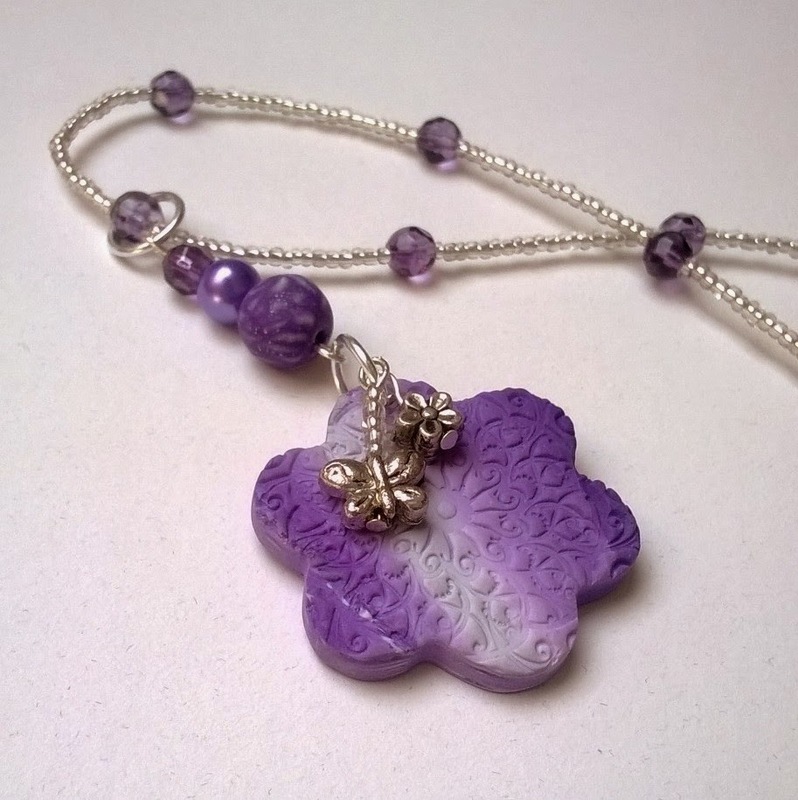 Well, this Flower Power daisy is in varying shades of purple with an a stamped embossed pattern and has two dangles - a Tibetan silver daisy charm and 4 tiny silver lined clear glass seed beads with a Tibetan silver butterfly charm. 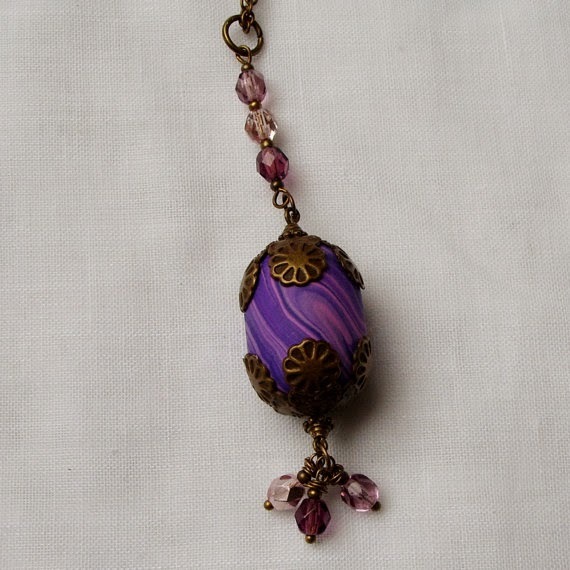 The daisy hangs from 3 beads in varying sixes and materials: a small purple glass crystal, a medium purple glass pearl and a large purple swirly polymer clay bead. 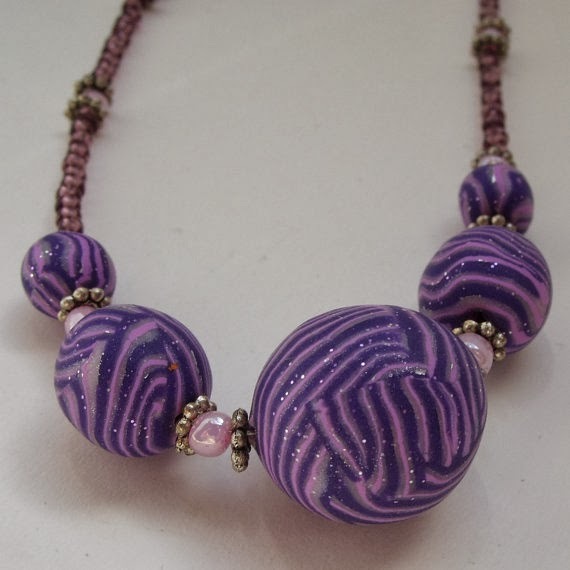 The pendant hangs from a necklace comprising of 14 purple glass crystals and tiny silver lined clear glass seed beads. Pendant drop measures approx 3 1/2"
The daisy pendant measures approx 1 1/2" x 1 1/2"
I've just listed these new items in my Etsy Shop. They;re one of a kind....so when they're gone, they're gone!! !